After checking out Amazon, there's a clear winner when it comes to small-but-mighty drying power. Source: Getty. Hate using hotel hairdryers because they turn your hair frizzy or end up filling the bathroom with a burnt-out-motor scent, having dried the hair of thousands before you? We figured there had to be a way of getting the same hair results you enjoy at home, without lugging a full-size hairdryer around on holiday. And after checking out Amazon, there’s a clear winner when it comes to small-but-mighty drying power. 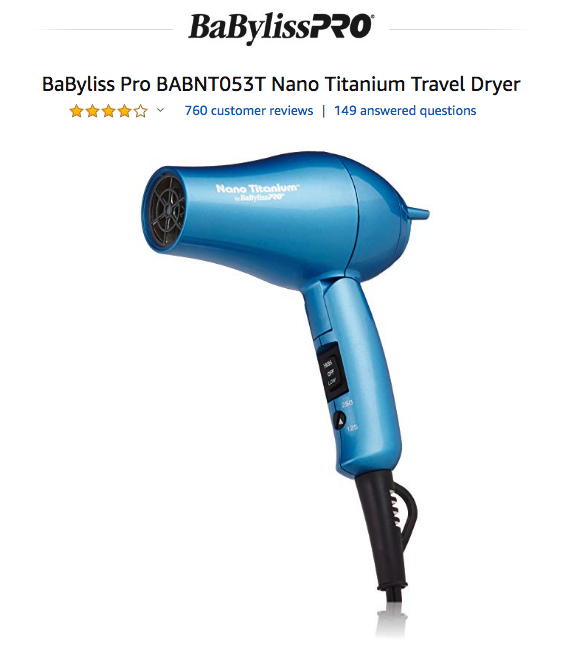 If you’re on the hunt for a lightweight travel hairdryer that is both efficient and powerful, look no further than the Nano Titanium Travel Dryer by Australian brand BaByliss. This sleek model has a foldable handle, duel voltage and two heat and speed settings. It’s also small in size and lightweight, making it the perfect choice for international travel. And it’s so great, many customers have taken to the global marketplace website to praise the styling tool. The popular hairdryer is currently selling for $32.99 on Amazon.